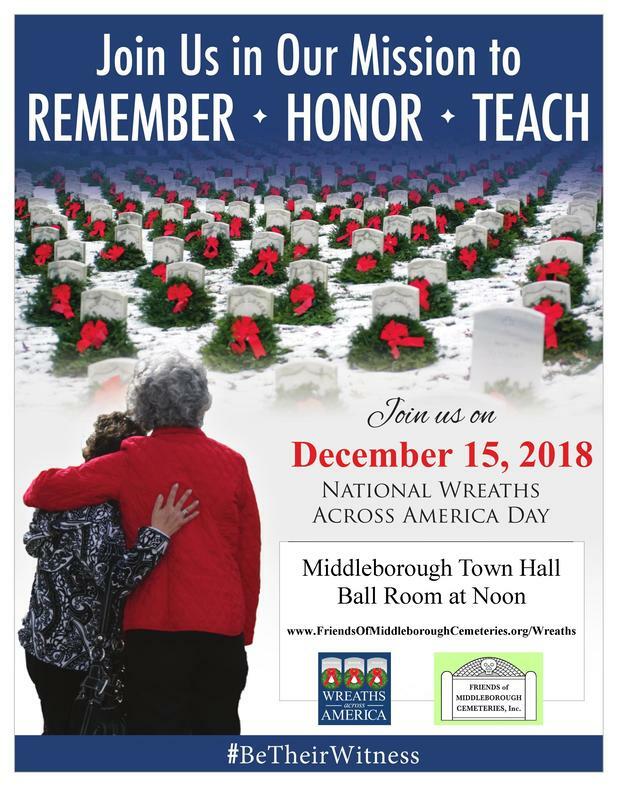 Our "Wreaths Across America in Middleborough" initiative! A primary purpose of this charity is to "to Preserve and promote the memory of those persons interred within Middleborough.". One of the largest subsets of the interred are Veterans. Middleborough was founded in 1669, and people have been stepping up and risking everything for our community ever since. Society at large made a promise to our Veterans that we will recognize their service, ALWAYS. This charity complements Middleborough's ongoing efforts to fulfill the promise with the work of our Veterans Team and our Civil War Veterans initiative. In 2018, we began a new, ongoing initiative, to support Wreaths Across America. Their mission and our purpose are complementary: both Commemorate our Veterans! Wreaths Across America aims to place a wreath at the grave of every Veteran for the holiday season. National "Wreaths Across America" Day is December 14, 2019. The FoMC will hold a Ceremony at noon in Middleborough, simultaneously with the other 1400+ cemeteries & communities nation-wide taking part. WAA's mission is to Remember our fallen U.S.veterans, to Honor those who serve, and to Teach your children the value of freedom. WAA fulfills their mission by giving you the opportunity to Sponsor a Remembrance Wreath for $15 each. The FoMC is proud to support WAA. You can "Sponsor a Wreath" by downloading the form from the button on the left and post-mailing it to us, through our page on the WAA site (click here! ), or by attending any one of the FoMC events throughout the year (before November 30th). 2019 is Middleborough's 350th birthday! We want every interred and remembered veteran to be included in the celebration. We need Volunteers to help find grave locations and create maps, Volunteers to speak to other organizations, Volunteers to provide the public with sponsorship opportunities, Volunteers to create our Remembrance Ceremony, Volunteers to place & remove wreaths, and Volunteers to publicize our efforts. We need you! You can be a part of this: Contact us! It is important to know that sponsorship of a wreath through the FoMC means that a veteran's grave somewhere in Middleborough will receive a wreath. Not all cemeteries might be participating or selected for inclusion. What we do depends upon the type of support we receive. What we do depends on you!